Machina differentiarum solutionem functionis polynomialis computat. Laboratorium computatrale, Moody Hall, Universitas Iacobi Madisonii, 2003. Computatio est quaelibet opera ad calcem directa quae computatra requirit, pro beneficio usurpat, vel creat. Exempli gratiae, amplectitur computatio systemata armaturae et programmaturae descriptarum, evolutarum, aedificatarum; varia datorum genera tractata, structa, administrata; scientificam computatrorum per computatra effectam investigationem; systemata computatrorum intellegenter agere facta; ac media communicationis et oblectationis creata et adhibita. Inter subdisciplinas computationis sunt ingeniaria computatrorum, ingeniaria programmaturae, scientia computatralis, systema informaticae, informationis technologia, humanitates digitales. Computatio generatim definire possumus ut significet ullam operam ad calcem directam quae computatra requirit, pro beneficio usurpat, vel creat. Ergo amplectitur computatio systemata armaturae et progammaturae descriptarum et aedificatarum ob multissima proposita; varia datorum genera rationis, structurae, et administrationis; studia scientifica quae computatris utuntur; facultatem qua systemata computatrorum intellegenter aguntur; creationem et usum mediorum communicationis et oblectationis; data ad quodlibet consilium spectantia inventa et conlecta; et cetera. Index est paene infinitus, quaeque fieri possunt vasta. 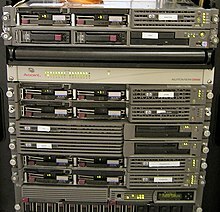 Computationi etiam sunt aliae significationes disertiores, contextu ubi nomen adhibetur innixae. Exempli gratia, systematum informationis peritus et ingeniarius programmaturae computationem aliter contemplabuntur. Praeter contextum, bene computare involutum et difficile esse potest. Quia societas homines requirit qui computationem bene faciunt, oportet nos computationem non solum professionem, sed etiam disciplinam habere. Disciplina computandi est studium systematicum rationum algorithmicarum quae data describunt et transformant, quod in earum scientia, explicatione, descriptione, efficientia, implementatione, et applicatione consistit. Quaestio principalis quae sub omne computatione iacet est "Quid automaticum efficienter fieri potest?" Vox computationis etiam est synonymum rationis; olim ad mechanicas computandi machinas spectandas adhibita est. ↑ 1.0 1.1 The Joint Task Force for Computing Curricula 2005. Computing Curricula 2005: The Overview Report (pdf). ↑ Anglice: "In a general way, we can define computing to mean any goal-oriented activity requiring, benefiting from, or creating computers. 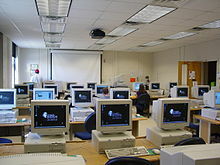 Thus, computing includes designing and building hardware and software systems for a wide range of purposes; processing, structuring, and managing various kinds of information; doing scientific studies using computers; making computer systems behave intelligently; creating and using communications and entertainment media; finding and gathering information relevant to any particular purpose, and so on. The list is virtually endless, and the possibilities are vast." ↑ "Curricula Recommendations". 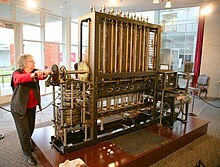 Association for Computing Machinery. 2005 . ↑ Anglice: Computing also has other meanings that are more specific, based on the context in which the term is used. For example, an information systems specialist will view computing somewhat differently from a software engineer. Regardless of the context, doing computing well can be complicated and difficult. Because society needs people to do computing well, we must think of computing not only as a profession but also as a discipline. ↑ Peter J. Denning, et al., Computing as a Discipline (Communications of the ACM, Association for Computing Machinery, Ianuario 1999). ↑ Anglice: The discipline of computing is the systematic study of algorithmic processes that describe and transform information: their theory, analysis, design, efficiency, implementation, and application. The fundamental question underlying all computing is "What can be (efficiently) automated?" Novissima mutatio die 24 Iulii 2018 hora 01:40 facta.